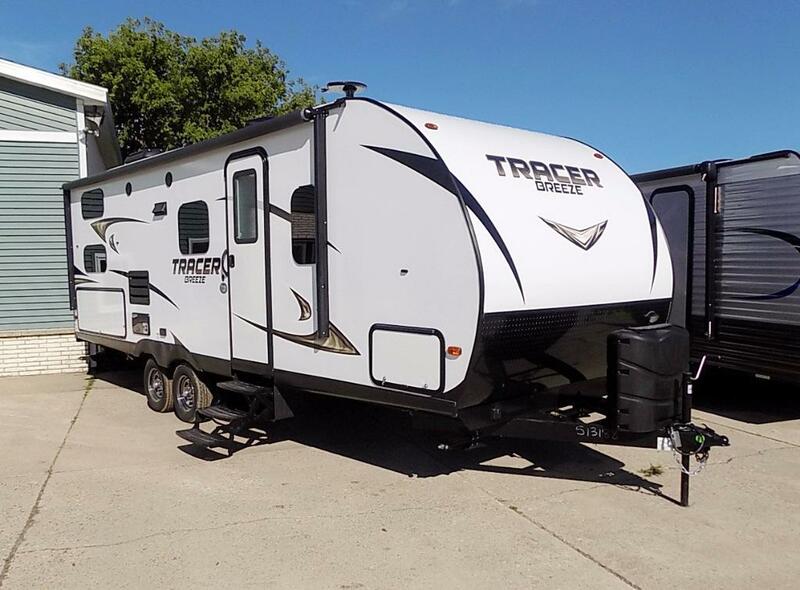 Features: A set of double size bunk beds, an indoor and outdoor cooking space, plus a single slide out for added roominess makes this Tracer Breeze travel trailer by Prime Time RV a great choice for any larger family to enjoy! This 24ft Ultra-Lite Travel Trailer offers a front bedroom with an Evergreen Select foam queen mattress for the owners to rest after a fun day of exploring outdoors. The kiddos will love their own double size bunk, they just have to choose between the top or bottom. The rear bath is conveniently next to the bunks for easy access at night for the kids. When it is time to relax inside, there is an LED flat screen TV and an 87" u-shaped dinette slide out. The dinette also provides extra sleeping space for 2 more happy campers. The cook in the family will surely enjoy using the outside kitchen while visiting with family and friends, plus more! Optional Equipment: Gas Grill, Camping Kit, Weight Distribution Hitch, Electronic Brake Control, Generator, Delivery, Set-Up and Pick up of unit. Available In: St. Cloud, Ramsey, Brainerd & Long Prairie! Available In: St Cloud, Ramsey, Brainerd & Long Prairie!